When I was getting ready for my wedding, I was worried we wouldn’t have enough cake. I wanted to find a solution that would feed everyone delicious sweets and add my personal touch. At the time, I was falling in love with a local Austin shop that specialized in Cake Balls.I meant to serve everyone a few cake balls to supplement the cake we had bought so I started practicing. I ended up having enough cake afterall, but now I love making these cake balls and have added my own twist on the filling. I’m sure we’ll look back on them as such a food fad, but I think they are the absolute perfect dessert. They are cake, frosting and chocolate all in one bite without the “I just ate a whole tub of sugar in that frosting” kind of feeling. It’s not too much, but just enough–although I have had days of eating these like candy too. This particular recipe I did because I was coming to visit Amanda for her birthday AND graduation from business school all in one day. Since she and I both have connections with Boston, I decided to do my version of Boston Creme Pie in a cake ball. I also wanted to celebrate her graduation so I tried to figure out a way to add little hats. They’re not the prettiest, but if you have square molds they might look a bit better. Hats are completely optional obviously, however I used melted chocolate cut into squares attached to a round caramel candy, but anything kind of cylindrical would work and a mini chocolate candy on the top. All of these were “glued” together with melted chocolate and then stuck on the top. First, bake the cake according to the box instructions or per your favorite recipe. Allow to cool completely–sometimes I make this the day before. This is also the easiest part because shape and flatness doesn’t matter! First, make the vanilla pudding according to instructions on the box and chill until firm. Funnel the completed pudding into a zip top bag and cut one of the bottom corner tips off to create a hole for piping. Line a baking sheet with parchment paper and pipe the pudding in little droplets onto the parchment paper so each one is about a 1/2 tablespoon of pudding. You’ll only need 30 pudding droplets at the most so if you’d like to use the rest of the pudding for something else, you should have some leftover. However, if you’re on a piping roll, these do make good snacks on their own. Put the baking sheet of pudding drops in the freezer and freeze until hardened. Spoon buttercream frosting into the cake and mix. The amount of frosting will depend on the kind of day and your preference, but it should make the cake moist enough to form ball that is not crumbly. I typically don’t use as much as other recipes recommend, but it is entirely up to you. Chill cake for about 2 hours in the fridge. This will firm everything up. Once everything is chilled, melt chocolate over a double boiler or in the microwave. If using microwave, I typically do this in 20 second increments, stir and repeat until smooth. Also, line a baking sheet or flat surface that is easily transported to the fridge with parchment paper to prepare for the cake balls. Then, use a disher or spoon to spoon out equal amounts of the chilled cake/frosting dough and form into a ball the size of a golf ball. Take a pudding drop from the freezer and stick into the ball like you’re hiding a pill for your pet inside a treat. Roll the ball in your hands to smooth out and dip in the chocolate. I am still perfecting my dipping technique but I have had the most luck with a trusty fork and then shaking off excess chocolate on the side of the bowl. When I transfer to the parchment paper I can usually smooth out the chocolate that was disrupted by the fork and cover with sprinkles or the topping. As stated above, if you are using sprinkles as your topping, this is the time to add them while the chocolate is still wet. If doing graduation hats or something that needs to be “glued” into place, wait until everything is hardened. Repeat with the rest of the cake and transfer what you have to the fridge for the chocolate to harden. Keep in fridge for 4-5 hours so the pudding inside can melt and then they are ready to consume! When Amanda first suggested this blog as something for us to do together, despite our distance, I was definitely excited. The next question after “Do we really want to do this?” (which was a resounding “Hell Yes”) was “where do we start?” Amanda and I really seem to bond over our love of flavorful and exotic spices and so we knew we wanted to start with something new. 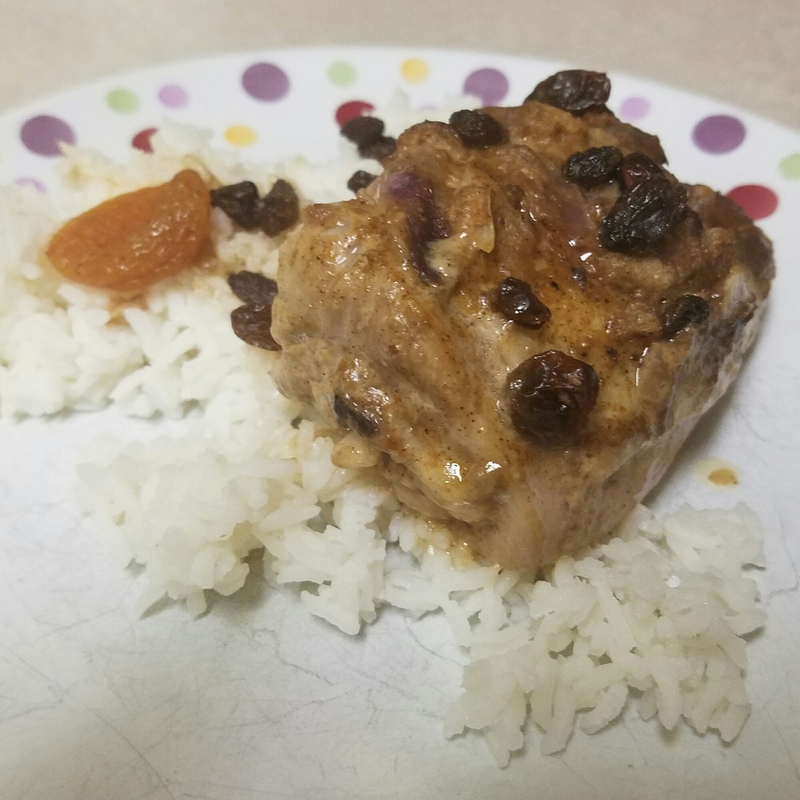 We chose African inspired dishes because it had both a combination of interesting flavor layers and it was certainly a cuisine I had never cooked before so it was something new and exciting with intriguing familiarity. We chose to do different recipes for this week’s installment as it was a bit last minute and my newly relocated pantry was a bit lacking. While Amanda was able to make a beautiful and interesting Moroccan Chicken, I was looking for something somewhat simple to start with ingredients I had on hand and something on the healthy side (having just moved across country my pants were/still are a bit tight from road snacks). So I decided on a simple, vegetarian Peanut Butter Soup recipe which, although not traditional, is inspired by the West African dish. I decided to use the recipe adapted from Hurry the Food up at http://hurrythefoodup.com/african-peanut-soup/ however, after 2 harried trips to the crowded grocery store I returned home only to be unloading my groceries from the car and saying to myself disappointedly “tomato paste!” I had forgotten to grab it and I then decided I was going to improvise because I certainly wasn’t going to deal with people any more that day. Cook in a saucepan over medium heat for around 12-15 minutes until liquid is reduced enough that it will not add too much liquid to the dish. I found that one 8oz can of tomato gave me around 1/4 cup of tomato paste. Now I was ready to start on the soup, which was quite easy and quite delicious. The recipe on the the website was straightforward. To up the nutrition content, I added a few handfuls of spinach leaves as I ate the leftover portions. If you have never tated this dish before, it tastes exactly as you wish it would. One giant, steaming bowl of peanut buttery goodness that would be the perfect comfort food for a cold day or really any day. Wine Pairing: To combine with the nuttiness in the dish I was craving a white wine tonight, which I can say I have never craved before. Generally I tolerate white wine if it is included in an tasting cases I order. However, tonight I paired this with a chilled Chenin Blanc which provided a light tartness to cut the strong peanutty taste as well as added an extra layer of temperature change. Here we go with our first distance dinner! For a new adventure, Merideth and I wanted to try a new cuisine: African dishes. Picking this large and varied continent for our first dish also gave us the chance to be creative with our choices. I chose Moroccan Chicken, with warm spices typical to the region. Something I learned from this dish was to read the recipe fully before starting- I showed up late for our Skype date because I didn’t plan for the hour baking time! Heat a large saute pan on high heat with 1 tsp olive oil. Season chicken with salt and pepper, add to hot pan, skin side down, and saute for 3-4 minutes or to a deep golden brown color. Remove and set aside, place in a crock pot or Dutch oven. Add onions and garlic to saute pan and saute for 2-3 minutes; add chicken stock and coconut milk and stir. Whisk in Maverick Moroccan spice and flour, bring sauce to a boil. Add sliced apricots and raisins and pour over chicken. Place in pre-heated oven at 350 degrees and cook for 1 hour. When serving, make sure you give everyone some apricots and raisins on top! Wine Pairing: In order to complement the chicken and the exotic spices, I had a delicious Marsanne from my local sustainable winery! A new wine for me for a new recipe. Delicious! I have a confession: this picture is from when I made the dish a second time! The warm spices are perfect for a cool day. Custard-based ice cream (using egg) takes longer since it usually has to be heated at some point during the recipe and therefore needs more time to cool down. However, it makes a richer, more decadent ice cream compared to the milk base. Delicious! My favorite thus far: browned butter ice cream. Can’t wait to try it on pies this fall! Cream-based ice cream takes less time, since the ingredients are usually combined already refrigerated, but letting the final cream sit and cool to let the flavors combine, even overnight, makes a better finished product. Though you can eat it straight from the ice cream maker (quality control, of course), both custard- and cream- based ice creams benefit from a quick refreeze to make a firmer consistency. 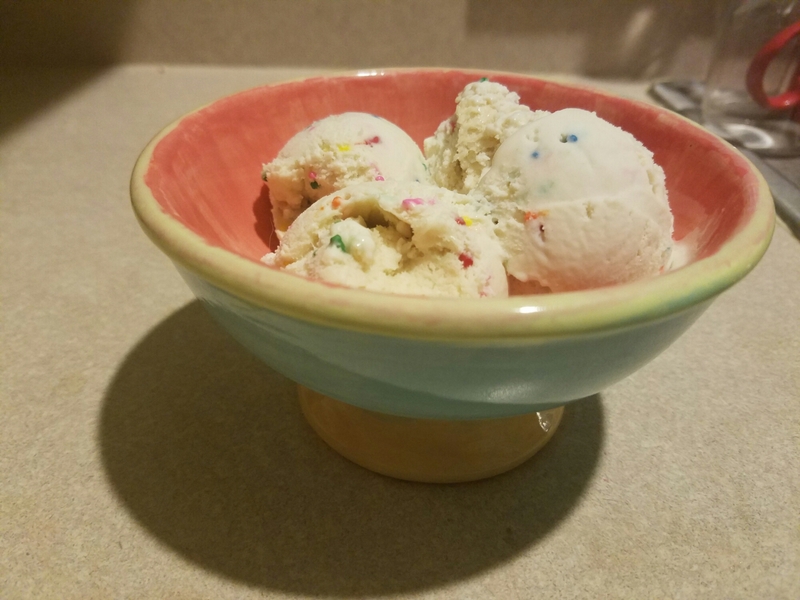 Being very particular on my birthday cake ice cream, I tried several recipes before finally settling on this one! 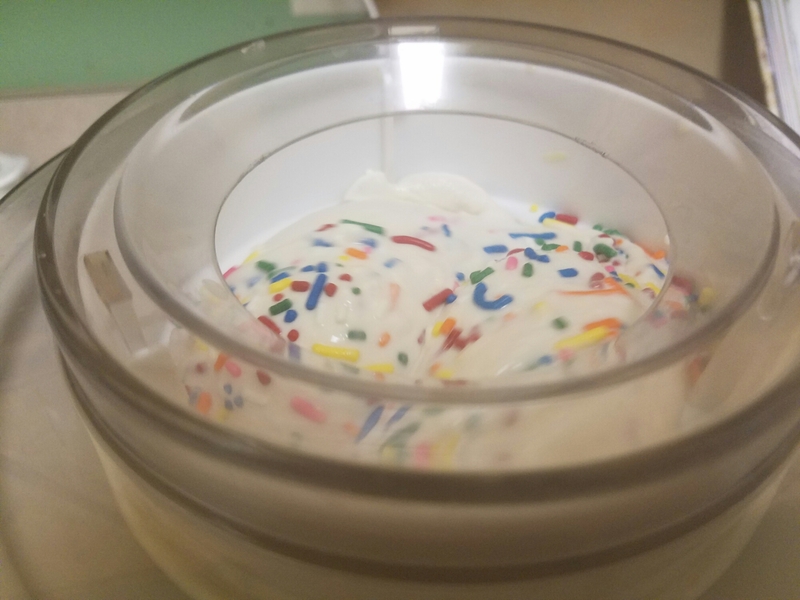 I used funfetti ice cream (and added more sprinkles towards the end of the process), but this can work with plain yellow cake mix as well. Blend all ingredients except sprinkles. Chill for at least two hours. Add mixture to ice cream machine and follow manufacturer’s instructions. Add additional sprinkles close to the end of the churning process (I added with approximately 5 minutes to go). Serve immediately or chill in freezer for firmer ice cream. Enjoy!